Product code: Q513 Categories: Modern & Retro Jewellery, Retro Rings. 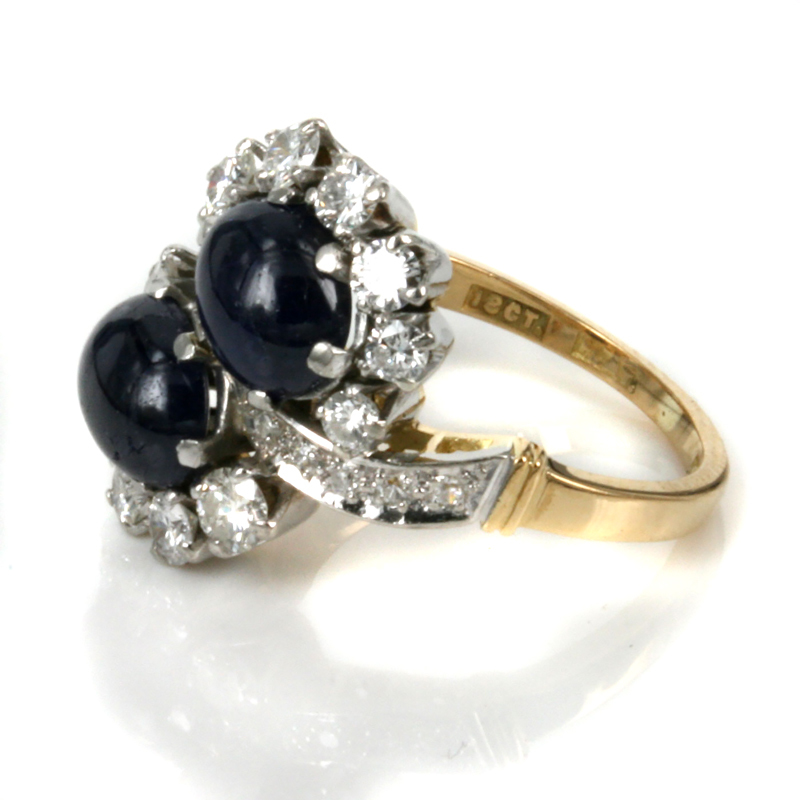 This ring has to be seen on the finger to get its full impact and is one of the most amazing sapphire and diamond rings around and is so typical of the jewellery being produced during the 1950’s when this ring was made. Made by the Australian jewellery firm Prouds, this ring was all hand made in 18ct yellow gold and platinum and is set with a combination of sapphires and diamonds in the most wonderful and captivating design. Set with two magnificent cabochon cut sapphires, these sapphires really stand out in this ring and steal the show. Cabochon is where the gemstone has a smooth rounded top instead of being facetted and gives this ring such a special look and style. With their elegant curved top, the sapphires total 4.05 carats in weight and look superb set against the white diamonds and platinum. With 22 diamonds to add so much sparkle to this ring, it is also the combination of the diamonds on the outer side of the ring as well as the band that all go to make this a truly unique and special ring. From one diamond at one end of the band to the other, the ring measures 17.8mm across by 17.9mm in the other direction. When this ring is on your finger, you will instantly fall in love with it as it is so captivating and special and a wonderful reminder of the rings that were being created during the 1950’s and just how wonderful and special they are. A fabulous ring made all the more special thanks to the use of two large cabochon cut sapphires.